Could Easy Identity Theft Be Lurking in Your Copier? It’s easy to forget about low-tech threats to your security and information that are lurking in your office. Today, we’re talking about your copier. And, the older it is, the bigger the risk. Making a copy on your Xerox machine is something that we never think twice about because we can hit the right buttons with our eyes closed (most of the time) and then they magically reproduce whatever we’ve fed them. But, were you aware that your copier holds onto the information that you give it, sometimes for a long, long time? 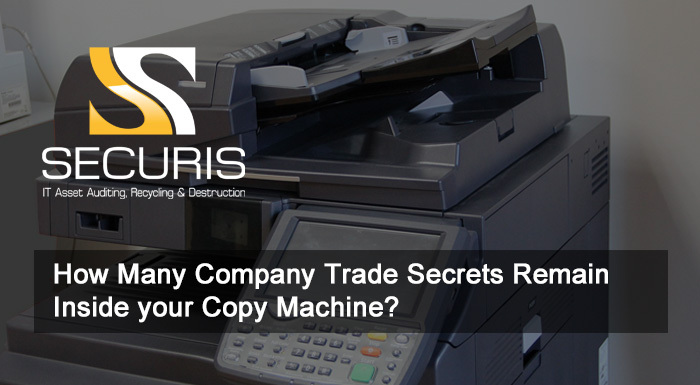 Copiers scan your documents to create replicas and then they store that information on an internal hard drive. That means a drive you can’t easily access — and may not have known about — could be holding some of the most sensitive company data that you’ve got. The information on your copier might be riskier than any of the computers sitting in your HR department. So, how big is the potential risk? Estimates say that multi-function copiers (which pretty much means all the copiers you’ll be using) can hold as many as 25,000 documents. Back in 2010, a CBS News investigation even found medical health records, which included the HIV status of an individual. That’s incredibly sensitive information that would put the patient at risk and put the company at risk of major fines and potential losses. The worst part is that selling any copier without completely removing and replacing that hard drive means you could spread documents to somewhere new and lose all control of them. I know a few of you are sweating about the last time you upgraded to a new copier and got rid of the old unit. Securis recommends you treat all electronics with data storage devices the same. That means computers, smartphones, tablets, and yes, those copiers all need to be treated with care to ensure that your sensitive information is removed. We do this by making sure that hard drives are completely wiped or removed before moving on in our closed-loop recycling process. We’ll make sure to shred or degausse any hard drive so that no one can ever access your data again. It’s time that we close this major privacy loophole and prevent any more data loss, especially in a device that we use so often but consider so little when it comes to security. We hope you’ll take a minute to review our data destruction services in your area and then share this little bit of knowledge with your coworkers and businesses you work with each day.